Another classic that I can't wait to read to my grandchildren. Dr. Seuss has nothing on Rick Felty and I'm certain Tabitha Fink tales will be passed down for generations. Smelly Trolls and Witches and Dragons, Oh My!! !These are the creatures that come in the night, to hide in our closets and fill us with fright. Little mouse, Bartholomew Blink, spends happy, carefree days with his friend, Tabitha Fink, a one-eyed cat. They play and nap and scamper about. But when the sun goes down and the dark settles in, Bartholomew begins to worry about what is lurking in the night. A mean, smelly troll who eats stinky socks behind the washer, a dragon with sharp fangs at the end of the hall, an evil witch hiding under the bed … these are the things that fill Bartholomew with dread. How will poor Bartholomew get past his fears?Even in the dark, and with only one eye, Tabitha Fink can see clearly how to help her friend Bartholomew. When things get a little dark and scary, Tabitha Fink turns into a Ninja at Night, armed with her courage, her good heart and a flashlight. Make friends with your monsters and they won’t seem so scary anymore, Tabitha advises Bartholomew.Any child who struggles with fear of the dark (and let’s be honest—some grownups too), will appreciate author Rick Felty’s clever, new twist on an age old theme. 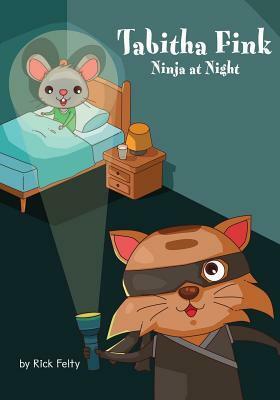 In addition to dealing with the dark, Ninja at Night teaches children kindness and empathy. “I’ve been there myself. I felt just like you,” Tabitha reassures her friend, Bartholomew. The eye-catching illustrations are precious, and the vivid, earthy colors so pleasing. The assorted “monsters” are scary, but not too scary for little ones—just right. And Tabitha Fink’s heartwarming approach to dealing with them fosters acceptance and inclusion. As in other Felty books, Tabitha Fink, with her one-eye, manages to see through what’s on the outside, right to the heart of each person (or monster).So kids—when it gets dark, put on your best Ninja pajamas, grab your flashlights and your courage, huddle up under the covers, turn off the lights, and read Tabitha Fink: Ninja at Night. You will be glad you did! Another wonderful Tabitha Fink book. I highly recommend it!Review by Deborah Stevenson, Author of award-winning children’s books, Soaring Soren: When French Bulldogs Fly and Oy, Elephants! Tabitha Fink is a cute cat and she is helping the timid mouse who she shares a house with sleep through the night. The illustrations are adorable and colors are vibrant. The story is written in verse, which is very enjoyable to read with a young child. The suggestions that Tabitha Fink gives the mouse are ones that any child could employ to overcome their fear of the dark. This will be a story that children will ask to read over and over. The other books in the series are probably also stories that will be very popular with young children. Things that go bump in the night Are sure to give you a fright.Yet the terrors might not want what you think,Learn from the night ninja, Tabitha Fink.My discovery of Rick Felty’s books is a delight. Tabitha Fink, the one-eyed, brown cat, as a character is inspired. As an author of children’s books that rhyme, I regret that it took me so long to find out about the series. He has published one a year since 2015. When given an advance copy (PDF) of Tabitha Fink: Ninja at Night for an honest review, I was excited to learn. Felty’s most recent work proves that a story told well in rhyme can bring a smile and anticipation even to adults. The unique character modeled after his family pet is pushed into an eerie situation that seems a big deal - to face fear of the dark. Tabitha’s mouse playmate Bartholomew Blink sees a slew of night terrors – a big furry monster, an evil witch, a dragon, some blue bears, and a smelly troll – in the lack of light. Felty’s cyclops hero confronts her friend’s fright as a black-robed ninja with a flashlight. The smooth word play, and the ability to blend them well with images is reminiscent of works Dr. SeussDr. Seuss or Shel SilversteinShel Silverstein. The Ninja at Night dilemma appears so trivial, but Felty, an Emmy-winning television producer, pulls even older readers into the tale with a tug at their memories of childhood frights. I flipped page after page to see Tabitha conquer the dark, and in the charming conclusion felt a child who hears or reads the story will find more than light. As the book ends with Tabitha’s standard, “Bye,” I consoled myself in the hope that next year the author might make more.